The Cyclamatic CX2 Bicycle Electric Foldaway Bike comes with fairly good quality components that should last a long time with good maintenance. The bike weighs in at about 51 pounds which is pretty heavy for a folding bike, but it folds to a size of 24 x 34 x 32 inches; compatible enough for any daily commuter. Let's take a closer look with our Cyclamatic CX2 Electric Foldaway Bicycle with Lithium-Ion Battery Review. The 20-inch wheels are fairly fat tires that make for a pretty natural feeling ride. The folding mechanism has a sturdy hinge that feels like it won’t snap or unlatch even in the roughest terrains. The folding action extends to the pedals which fold up to save some extra inch of storage space. All this makes the bike a great choice for commuters who wish to bring it with them on the train, or bus. The 250-watt motor may not be terribly powerful, but it’s capable of hitting top speeds of 13-15 miles per hour on a flat surface with partial pedaling. The bike is advertised at 30 miles of range, but you are likely to get slightly less than that depending on the terrain and slopes. You have the choice of how much work you want to do using various operational modes. You can use it as a bike with no electric assist at all or choose a partial electric assist mode to amplify your own efforts. It, however, doesn’t have fully automatic electric mode - some degree of peddling is always required. The Cyclamatic CX2 is ideal for commuters, travelers and those with minimal storage. The improved version includes a new more powerful brushless motor, a 6-speed gear system, a new upgraded battery, and improved reliability. The steel frame, quick-shift gears, and strong v-brakes offers all the qualities of a premium bike with the added benefits of a quick and easy compact folding mechanism and three pedal assist modes. Overall this is a very good bike in this price range and I recommend it to anyone who needs a dependable e-bike that saves both space and money. Battery: Equipped with a new 24 volts, 8 Amp Lithium-ion battery which runs the electric system of the bike. This battery weighs much less than the conventional car battery and has a low discharge rate. The battery facilitates up to 30 miles of distance range on a single charge, which is commendable for a bike of this size. There is also a smart lithium battery charger for fast charging - should take about 4 to 6 hours to fully charge the battery. Motor: 250W high-speed brushless gear motors will easily assist you to travel at the 15mph road speed limit. This might not be one of the most powerful motors you will find on an e bike, but it is good enough for a typical commuter. Wheels: The 20-inch ultra strong wheels are made of magnesium alloy integrated with anti-slip resistant thick tire material. The tires are wide enough to give a natural feeling ride that makes the bike suitable for a wide range of terrains. Brakes: The bike comes with reliable front and rear v-brakes for rapid deceleration. Foldable: the bike can be easily folded into a half its size to make it more portable for ease of storage or transportation. The final folded size of 24 x 34 x 32 inches will fit in just about any standard car trunk. Choice of operational modes: You have the choice of how much work you want to do. Use the bike as a bike with no electric assist at all or choose a partial electric assist mode to amplify your own efforts. You can enjoy any mode depending on how much pedaling you’re willing to do. The CX2 features three levels of pedal assist, low, medium and high, selected by simple controls on the handlebar. Style & Safety: The bike features a padded saddle, quality 20” Kenda Tyres, mud guards and 6-speed Shimano gears for a comfortable ride. You will also find the electric lights, bell, and reflectors handy in enhancing your safety on the road. Brakes: Front and rear V-brakes. Great performance: The bike is fitted with a 250W motor that enables it to achieve a top speed of up to 15miles/hour. The battery can cover up to 30 miles on a single charge, which should be more than enough for a typical commute to and back from work or school. Portability: this is a very convenient bike especially when storage space is limited. The folding action reduces the space required by a half and also makes it easy to carry. 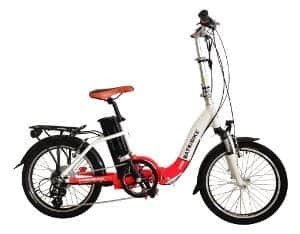 Affordable: The cost of acquiring this electric bike is much cheaper compared to a fully gas powered bike and even most of other e-bikes in the market. Additionally, the cost of maintaining it is very low as most parts used are high quality and durable..
At 51 pounds, the bike is a little heavy for younger riders to carry even though the folding action makes it portable. The Cyclamatic CX2 is currently unavailable. A good alternative is the Bagibike Batri-Bike Dash Pro Folding Bike. Very similar build and priced at $999 at ebike Generation. Be sure to get the right size with the Amazons Bike Fit Guide. 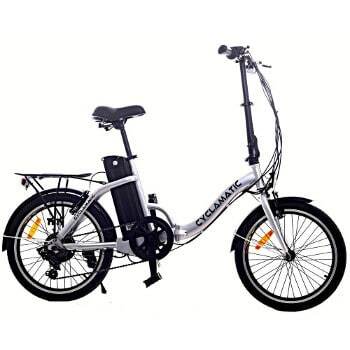 They Cyclamatic Foldaway is one of the best folding electric bikes for the price. It hits a nice middle range for space saving and a good ride. The aluminum frame and lithium Ion battery are well integrated, which makes it a perfect choice for adventure as well and daily commuting. This bike’s overall design is compact, convenient and efficient for use by any rider 14 years and above. Here to provide you with info and reviews and just plain cool stuff. Electronic device advice. Do Smart Homes Really Save Energy? What Smart Devices Work Well with Google Home? What is Smart Home Automation and how does it work? Do electric bikes charge when pedaling? Why do electric bikes cost so much? Hi! I am Pete the guy behind Gear Gadgets and Gizmos. I am an active techno nerd that loves music, E-bikes, and cool new technology gear, gadgets, and gizmos. This site is a go-to resource where I share with you what's new and exciting in the Gear Gadget & Gizmo world. Special promo code PETEL20 and get 20% off when you order a pair of Sandals or Insoles. Gear Gadgets and Gizmos is a participant in the Amazon Services LLC Associates Program, an affiliate advertising program designed to provide a means for sites to earn advertising fees by advertising and linking to www.geargadgetsandgizmos.com (amazon.com or amazon.ca) We are also part of other affiliate programs where we earn a small fee if someone makes a purchase.